HackForGood is all about encouraging people to come up with innovative ways to use data for social good. 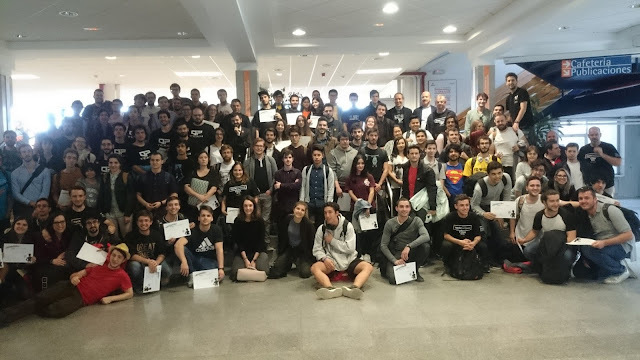 The fifth edition of Hack for Good took place at the Escuela Técnica Superior de Ingenieros de Telecomunicación at Universidad Politécnica de Madrid from Friday March 10 to Saturday 11. The event aims to cultivate young talent, encouraging this through active participation and a wide range of prizes and awards. Our Chief Data Officer, Chema Alonso, gave an inspiring talk about his career, which started helping his father paint houses during his free time to being selected to join the board of Telefónica. Chema also discussed how it is important for Spanish universities to encourage the engineers of tomorrow to become technology makers, driving innovation as well as challenging themselves on a day to day basis in their degrees. Hundreds of students took part in the event, tackling social challenges with technology such as creating an app to support blood donation and a solution to work against cyber bullying as well as developing a smart food app to optimize food usage. Some students even created an app which combat game addiction. Many fantastic projects were created and we were super impressed by the quality of the team pictured below, who used CARTO to visualize Telefónica mobility and consumer data in Colombia to detect poverty and the movement flow of the population of each munincipality. Students spent their weekend working hard to apply data for social good, working late into the hours of the night to meet the pressing deadline. One team member, Andrés, who took part in the LUCA Challenge, said: "This is a perfect opportunity for us to apply our knowledge to have a social impact".